Map of Mexico and Central America. Map of the West Indies. 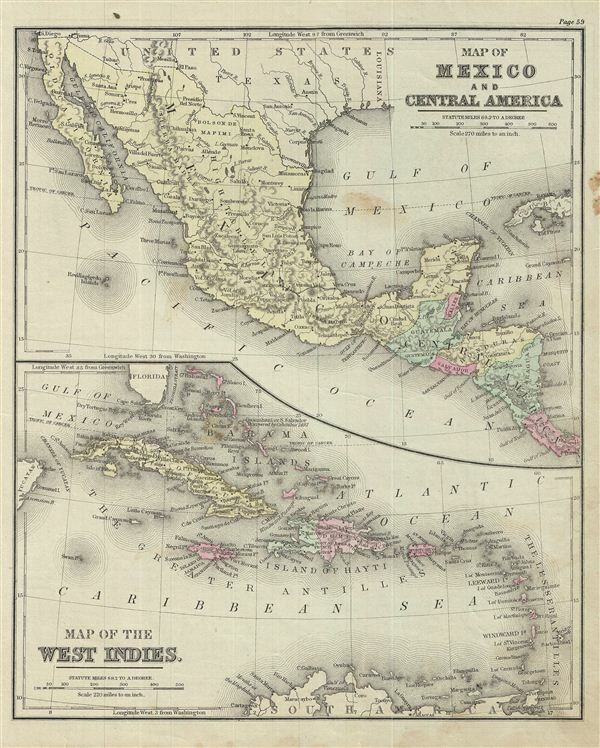 This is an example of David M. Warren's 1879 map of Mexico, Central America and the West Indies. Divided into two parts, the upper map covers Mexico and Central America from Mexico to Costa Rica. The lower map details West Indies from the southern part of Florida to the northern part of South America and includes the Greater and Lesser Antilles as far east as Barbados. The map identifies the island of Guanahani or San Salvador in the Bahamas as the site where Columbus supposedly landed on October 12 of 1492. Throughout, the map identifies various cities, towns, rivers, islands, mountain passes and an assortment of additional topographical details. The map is color coded according to regional and political boundaries with elevation rendered by hachure. Issued as page 59 in the 1879 edition of Warren's Common-School Geography.